Published: April 29, 2014 at 10:14 p.m. 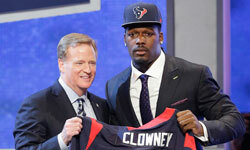 Updated: April 30, 2014 at 11:29 a.m.
NFL Media analyst Mike Mayock evaluates hundreds and hundreds of football players in the lead up to the 2014 NFL Draft, and he's passionate about a lot of the ones that catch his eye. One player he's seen a ton of in person, thanks to his job as a color commentator on Notre Dame football games, is offensive linemen Zack Martin. Though Martin isn't mentioned in the company of elite linemen such as Greg Robinson, Jake Matthews and Taylor Lewan, Mayock believes Martin will be off the board earlier than most think. "I've been banging the table for Zack Martin," Mayock said on "The Rich Eisen Podcast" on Tuesday. "I had a bunch of scouts tell me before the Senior Bowl that he'd never get into the first round. Now they're talking about him in the top 10. So Zack Martin's a guy that Iâm really excited about." Martin (6-foot-4, 308 pounds) has risen steadily throughout the draft process since leaving South Bend and is well regarded for having the versatility to play inside as a guard or outside as a left or right tackle. Martin's height and arm length have many thinking he's best suited to be a right tackle or guard in the NFL, however, so he's had some ground to make up to catch the elite players at the position in the eyes of scouts. NFL Media analyst Daniel Jeremiah, who rates Martin as his No. 19 prospect, tweeted this week that he believes Martin can be a solid left tackle has Pro Bowl upside as a guard. NFL.com mock drafts have frequently pegged him as a potential fit with the Miami Dolphins with the 19th overall pick in the first round. Mayock thinks he'll be off the board long before then, though, and that teams may be jockeying to move up in the draft if they want to have a shot at landing Martin. "There's going to be three offensive tackles off the board quickly," said Mayock. "I think Zack Martin is going to be gone in the first 13 picks. So I think four offensive tackles will be gone in the top 13, maybe the top 10." Last year, a record number of offensive linemen were taken in the first round and three tackles cracked the top 10. If the 2014 NFL Draft wants to top that success among the big boys up front, it probably comes down to whether a team agrees with Mayock and picks Martin within first 10 picks.